Technology has advanced dramatically as a major contributing factor in education and in foreign language learning particularly. New and diverse online learning environments have offered the alternative for language students to complement language learning traditionally taken place in the classroom with enhanced interaction in Online Language Learning Communities (OLLC). 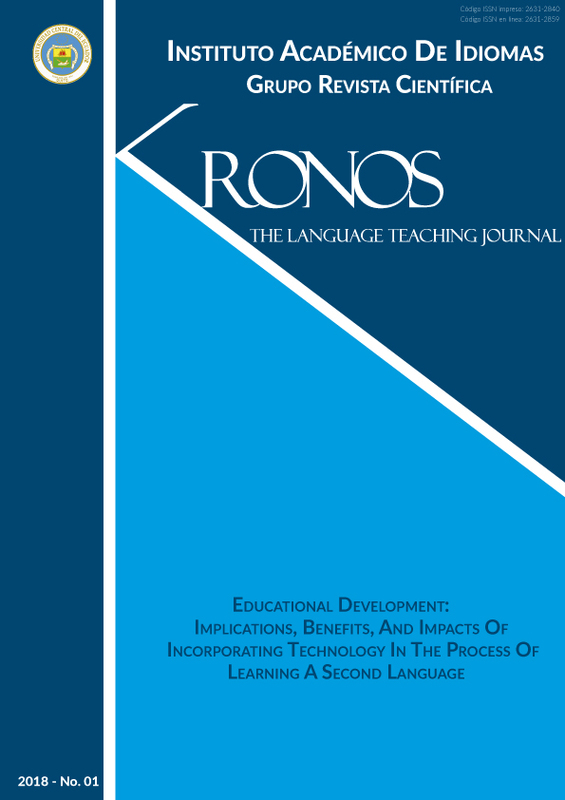 This research is based on a mixed method design and examines the use of significant OLLC aimed at improving pronunciation in A1-A2 English Level students at the Language Academic Institute of Central University. The data were obtained through the statistical values reported by the OLLC of the experimental group, as well as the statistical values reported by the textbook platform. Voice recordings were used to reveal if OLLC are effective in relation to the development of pronunciation. Additionally, after applying a questionnaire related to the OLLC used, the OLLC that was considered most appropriate and pleasant for the students during the work time was determined. Finally, the results indicated that the students who participated in the OLLC improved their pronunciation by decreasing the number of pronunciation errors. Brown, A. (1992). Survey of Attitudes and Practices Related to Pronunciation Teaching. AMES. Australia. directions. Masters Thesis. University of Technology, Sydney. Ltd., Retrieved February 4, 2018. http://www.youtube.com/watch?v=tLYk4vKBdUo/. English as a second language. Department of Education, Training and Youth Affairs. Australia. Harmer, J. (2005). The Practice of English Language Teaching. UK. Hernández, R. (2014). Metodología de la Investigación. México: McGraw Hill Education. Jenkins, J. (2002). Global English and the Teaching of Pronunciation. British Council. UK. A. & Greener S. (Ed.) Academic Conferences and Publishing International Limited (CPIL). UK. Kelly, G. (2012). How to teach pronunciation. Pearson Education Limited. UK. High Schools in the context of E-education and E- Society. Conference Paper. Ecuador. text-nased computer conferencing. Journal of Distance Education, CAN. Asynchronic Learning Networks: The Research frontier. New York: Hampton Press, 239 -260. Teaching Pronunciation. Macmillan Publishers Ltd., Retrieved February 27, 2018. http://www.onestopenglish. Trask, R. (1996). A Dictionary of Phonetics and Phonology. UK. Ur, P. (2012). A course in English Langauge Teaching. UK. Walker, R. (2001). Pronunciation for International Intelligibility. Retrieved April 20, 2018. http://www3. Zhao, R. and Chen, J. (2014). Social interaction and continuance intention toward online language learning. Zourou, K (2013). Research challenges in informal social networked language learning communities. on January 15, 2018, http://www.openeducationeuropa.eu/sites/default/files/asset/In-depth_34_4. language education (pp.77– 99). Basingstoke, UK: Palgrave Macmillan.